Introduction: The optimal method for closing gastrotomies following transgastric instrumentation has yet to be found. Our center has previously validated the use of a bioabsorbable plug for this purpose. 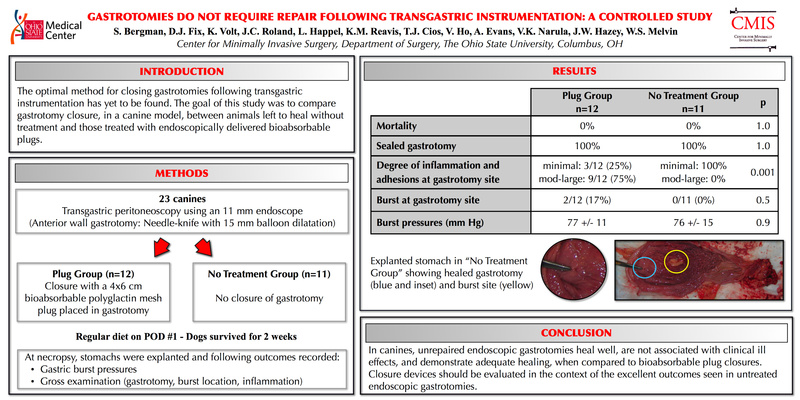 The goal of this study was to compare gastrotomy closure, in a canine model, between animals left to heal without treatment and those treated with endoscopically delivered bioabsorbable plugs. Methods: Twenty-three canines were anesthetized and underwent upper endoscopy during which an anterior wall gastrotomy was performed. This was then balloon-dilated to 15 mm to allow passage of the 11 mm endoscope. The plug group (n=12) then underwent endoscopic placement of a 4×6 cm bioabsorbable mesh plug in the perforation, whereas the “no-treatment” group (n=11) did not. Animals were given a regular diet on the first postoperative day and were sacrificed two weeks later. At necropsy, ex-vivo intralumenal gastric pressures were measured while filling stomachs with water until they perforated. Gastrotomy and burst locations, as well as the degree of adhesions and inflammation, were evaluated. Data are expressed as mean±SD or proportions and analyzed with Student’s t-test and Yates corrected chi-square, respectively.